Cox Plantation in Smuteye, Alabama. Festivities start around noon. The Pork Procession (serious eating) will begin between 2:00 and 3:00 p.m.
And weather permitting, we’ll have a bonfire at dusk. SMUTEYE - Once again, we (Margaret and Major) invite our friends from near and far to gather at the our antique farm and celebrate the beginning of hog killin' time. Margaret began this feast to celebrate Major’s birthday in the tradition of his great, grandfather, Major Cox. Today, Major avoids discussing "birthdays," but this autumn festival continues to provide an afternoon of good friends, great food, and fun-filled fall activities. Wayne Jones will once again head the team of Pig Roasters. Starting Friday evening, we expect roasting to take approximately 14 hours. A few brave souls will spend the night camped around the hickory and oak bonfire that produces coals for the pit. The bar at the Pavilion-Guest House will be stocked and open to guests assisting Wayne and the hog roasters. Call if you’d like to be one of the few, the brave. 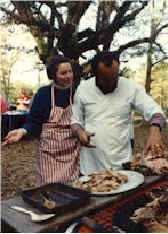 . .
On the day of the roast, Chick Cleveland has agreed to return by popular demand to serve as the Fire Master. In addition to the pig, Margaret will once again build a fire under the cast iron syrup kettle and create her Fabulous, Four alarm, Fifty gallon chili. In addition, guests are invited to bring salads, vegetables, desserts, and beverages to add spice to the banquet. Bring a large appetite! Before the feast, we’ll have a tractor-drawn hay ride around the South 40. The Smuteye horse herd will be happy to see all. But Margaret can’t allow riding (other than a few pony rides). The crowd over-excites them. We’ve added a new entourage (that’s fancy for "herd") of African Pygmy Goats (caprines) to our collection of equines. This is an outdoor event. Please wear casual clothes, comfortable shoes, and a jacket or extra sweater to complement the brisk autumn air. A past guest of honor . . .
© Copyright 1988-2011. Cox Plantation. Please do not reuse these images without permission.